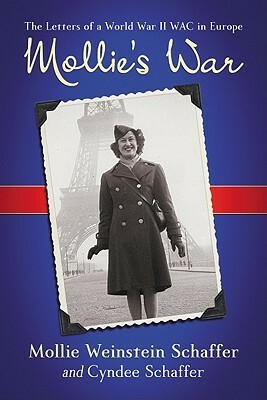 Mollie’s War offers readers a unique view into the lives of female soldiers during WWII, specifically the life of Mollie Weinstein, a young woman from Detroit enlisted in the WAC; The Women’s Army Corps. In this book we are given a very personal account of her experiences as shown in her letters to family and friends, from her enlistment in October 1943 up until 1945, when she was honorably discharged. I have honestly never read a story put together in such a way, but it made for a very real and informative read. Over the course of Mollie’s time with the WAC she had written and received a total of 350 letters; letters her daughter, Cyndee Schaffer, felt compelled to share with the world. The project itself had taken years to complete and the help of many friends and family members, but it was well worth the effort! I enjoyed reading Mollie’s letters, seeing how she handled her ever changing surroundings and her willingness to take on whatever the WAC had asked of her. Her attitude was positive and refreshing, seeing the upside to almost every situation and making sure to take in and experience the different cultures around her. Along with Mollie’s exchanges, we’re also given snippets of information about the war and the WAC itself, which proved helpful as my knowledge of the war is quite limited. I think this memoir would be perfect for anyone who loves history and reading about World War II, or those who are interested in getting a true glimpse into the lives of the WAC during WWII. Sign into Goodreads to see if any of your friends have read Mollie's War.